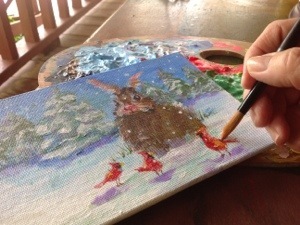 I am so excited to announce my new Christmas painting theme, it’s all about bunny rabbits this Christmas season. I used to think that Christmas in July was so not cool until I started painting seasonal subjects, now I understand the time and planning that must be done prior to Christmas. I will be posting new bunny paintings each month before Christmas… Would like to hear from you.